Developing a results oriented website is the most important investment you can make in your small or medium sized business. Our internet services can get you the necessary results your business needs to succeed! 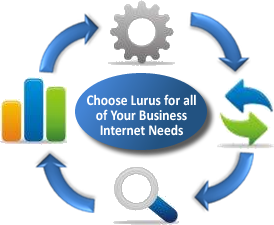 Lurus Professional Web Services is a leading provider of business Internet services including web design, web hosting, e-commerce, and Internet marketing. Lurus builds customized, scalable solutions that deliver value and performance in the Arizona valley of the sun and throughout the United States. Lurus focuses on building long-term, valuable relationships with our customers so we can meet their needs both now and in the future. Lurus Internet Marketers are Google Certified Professionals and Lurus is a proud member of the Arizona Chapter of the Better Business Bureau. Are you Looking for a Full Service Website Development and Internet Marketing Company? With companies making the shift to online and internet for sales and marketing, it is of utmost importance to have a website professionally designed and built web presence. A professionally designed and built website will follow best known methods for search engine optimization (SEO) and for getting business results. Always make sure that the company you select specializes in not only website design services, but also can offer internet marketing services. What good is a fantastically designed website that no one sees? Remember that when looking into website design services, it is critical to check out the experience the particular designer or website development company. Go through their portfolio and look at what they've done for other companies. Do research into website development so you will have some knowledge when you go into the first meeting. Best of luck with your company and rest assured Lurus is here to provide you with the best professional services available on the internet! Why is Lurus Different when it comes to Search Engine Optimization? The formula for success in Search Engine Optimization (SEO) is not a secret. However, some companies fail to asses the larger picture of SEO combined with a well thought out and implemented internet marketing campaign. Traffic is just one piece of the puzzle. Lurus combines traffic, usability, and conversion analysis to deliver top business results. For SEO to be successful it is essential to have a well balanced combination of on page optimization services as well as off page optimization services. We are Professional SEO consultants and we will teach you the keys, tips, and trick to be successful. You may have also heard of the important of key word research. At the start of every project, we do extensive keyword research to discover the most profitable keywords within your target market. Lurus also specializes in link building campaigns, one way linking advice, and SEO copy writing that focuses on optimized article writing. Pay Per Click (PPC) is not a solution for everyone. PPC can become very expensive if you do not do your homework up front. With years of PPC management and PPC campaign optimization experience, Lurus has developed unique strategies to minimizing your costs while maximizing your profits. In our effort to maximize your ROI, Lurus conducts extensive keyword research testing to determine which ads, keywords, and landing pages gets the best results. In addition, we do extensive pay per click on page optimization to lower your overall costs per click. We can't give away all of our secrets! Please take a moment to fill out our form and receive a free website evaluation from one of our certified Internet marketing professionals.